We, the undersigned residents and friends of Tanjung Bungah, Penang, are shocked to learn about plans for a massive property development project on a 19.08 acre plot of land, located between Jalan Sungai Kelian and Jalan Loh Poh Heng, Hillside. The proposed project, submitted to MBPP (formerly known as MPPP) by Tetuan Taman Sri Bunga Sdn Bhd (Boon Siew Group SB) comprises two 50-storey buildings, one 49-storey building, one LMC 34-storey building, and 21 houses - a total of 914 units. The proposed project, if approved by MPPP, will forever change the character of Tanjung Bungah. The extremely high density of this project, with buildings almost the height of Komtar, will overwhelm the entire residential area. Residents living next to the proposed project and surrounding neighbourhoods are concerned that such immense height and density will impact adversely on the already stressed environment and infrastructure (eg. water, sewage and air quality) as well as the safety and health of residents. With a density of 914 units, an estimate of two cars per unit, about 2,000 additional vehicles will be plying the already congested roads of Loh Poh Heng and Jalan Sungei Kelian. And this has yet to take into consideration other parcels of land in that vicinity that are slated for future property development. To cope with the expected additional vehicles and traffic, the proposed plans include cutting down the trees along Jalan Sungai Kelian to expand it to a four-lane highway! This means, when residents there open their gates, they (and their children) will literally step into the busy flow of traffic on the highway. What about the fate of Jalan Loh Poh Heng and its trees? This Hillside area of Tanjung Bungah has been known for its low density, serene environment and beautiful tree-lined roads. Its residents walk to the neighbourhood market, shops and restaurants, and walk or jog safely along the roads, particularly up to Pearl Hill, while cyclists from near and far do their initial training up the hill. We are concerned that the proposed plan does not have sufficient buffer zones and green lungs like sizeable parks. There are insufficient details of any greenery, open park or recreational areas that should be preserved. The extraordinary heights of the buildings also raise safety and aesthetic concerns. We already know the traffic woes of those staying in the northern corridor. The proposed project will add to more headaches and nightmares for locals and tourists alike. Residents of Tanjung Bungah are not against the development of housing projects. But we would like Tanjung Bungah, indeed the rest of Penang, to be a place for sustainable and holistic development - not a high-density concrete jungle with poor supporting infrastructure. The proposed structures are way out of proportion to others around them, creating an eyesore and ugly scar on the surrounding neighbourhoods. - they abide by the Penang State Structure Plan 2007, which states that there should NOT more than 15 units per acre within the Tanjung Bungah area. The proposed project has 49 units per acre, way beyond the stated limit. - the Jalan/Lorong Sungai Kelian junction leading to the proposed project remain closed. - there should be adequate buffer zones (at least 100 feet from the property of the affected residents) and that these be clearly stated in the proposed plan. - there should be sizeable green lung/parks (not just pockets of green). Residents of Tanjung Bunga have submitted our concerns to the MBPP, our political representatives as well as to the Chief Minister of Penang YAB Lim Guan Eng. We sincerely hope that the relevant authorities will consider our concerns to ensure that the Northern Corridor of Penang Island remains environmentally sustainable and liveable to realise a better quality of life in line with Penang’s vision of holistic development. 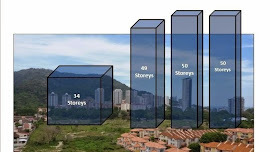 If this massive proposed project is approved, we fear that it will set a precedent for other such Komtar-height projects to be built all over residential areas in Penang. We call upon all residents of Tanjung Bungah and Penang to sign and share this on-line petition. Your support is urgently needed to urge the State government to address all of the above issues before any approval is granted. Please help us save Tanjung Bungah and Penang Island! We do not want Penang to become a blemished Pearl of the Orient. Malaysians are quick to envy the progress of other countries like Singapore and Hong Kong. And when progress comes to the door step, they shut the doors condemning all sort of issues. If they so much love the greens, then move to Pahang or nearby Perak to enjoy their early retirement there. Malaysia is relatively a big country compared to Singapore and Hong Kong. We have 14 states and if all states are in 'vegetation' state, Malaysia will be a goner! There will be no income generator. Looking at history, vibrant and progressive states are those relatively open socio-economy landscapes and coastal areas where centuries ago ships berthed. Penang, Lumut, Klang and Pasir Gudang are some examples. When there is progress, purchasing power improves. When purchasing power improves, lifestyle and demand get sophisticated. The barriers are always environmental and racial conservatism. These areas are the nucleus of development and technically it should spread inland. Unfortunately, progress towards inland is stifled by the mindset of racial turmoil that embeds into unsustainable policies. Centuries today, places on mainland but still within coastal reach are relatively still underdeveloped, such as Bukit Mertajam, Kulim, Perak as a whole and smaller towns in Johor. If Singapore can be fully developed in 50 odd years, why not Malaysia with richer resources. There are always trade-offs. I am not saying that concerns are invalid, but be fair and holistic. Make constructive and reasonable comments where progress and quality of life can both be improved although not equally. Penang as a 'cornered' states can definitely progress meaningfully if we get the priorities right and build the right pillars of a dynamic state. Money is the only currency to development and nothing Penang cannot do despite lack of natural resources and Federal restrains. With money, Penang can deploy technology in achieving holistic progress. But where does money comes if not from economic development? Unless and until we learn about the economics, don't try to be a saint. If we want to be a saint, live in the jungle and preach amidst the clouds and stars!